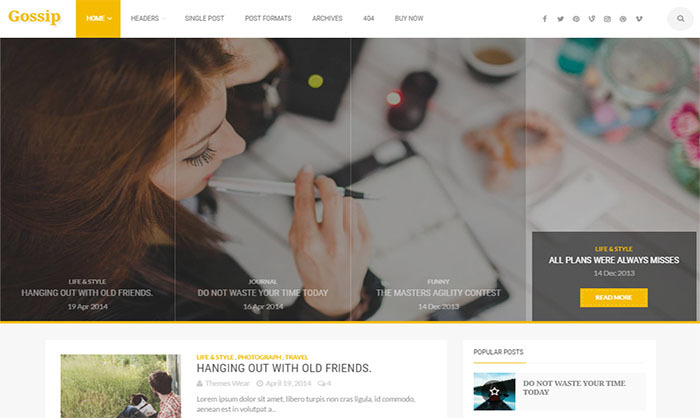 Gossip Blogger Template is a minimalist , responsive and SEO friendly theme. By Using gossip template you can easily show your stories, express yourself and photos. We know that you need a simple and fully customizable theme which you can manipulate in very short time and that’s why we’ve created gossip template with modern look to make your site more attractive. If you’re looking for one Responsive and Unique template for your Stories or Personal blog then we highly recommend you to use them theme on your blog because it’s some advanced and awesome features that you ever want in any free blogger template.